St George’s Bloomsbury is the sixth and final London church designed by the leading architect of the English Baroque, Nicholas Hawksmoor. It was one of the “Fifty New Churches” for London proposed by Queen Anne’s Commissioners. The church was consecrated in 1731. In 1781 the interior was rearranged with the altar being moved from the east to the north. Subsequently the tower entrance was blocked, and for a time part of the eastern apse was boxed in. The north gallery was also removed and a gallery was built along the east. In 1838 a second gallery all round the church was considered, but not built. Instead the partitioning was removed from the eastern apse, as a result of which “a richly ornamented ceiling was discovered”. 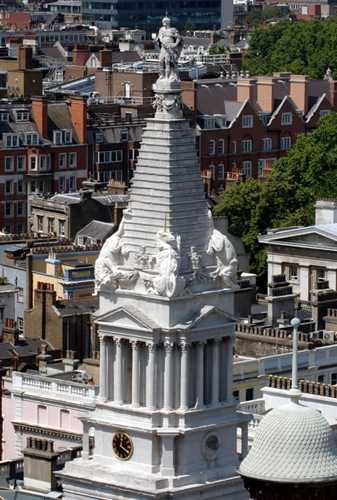 In 1871 the lion and unicorn on the spire were found to be in bad repair and were taken down by the architect G.E. Street. He recommended the removal of all the galleries except the south one. St George’s was reopened to the public in 2006 after a major restoration. During this work the altar was reinstated in the eastern apse and the lion and unicorn were replaced on the spire. I was commissioned to carry out the paint analysis of the interior. 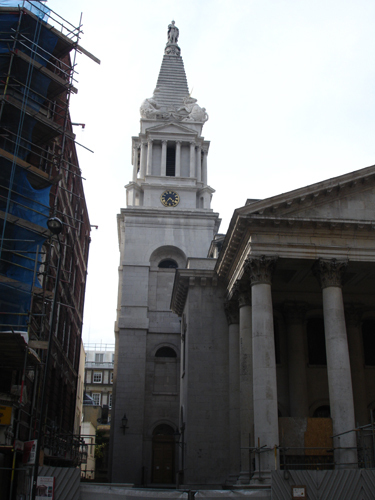 I had already worked on two other Hawksmoor churches. The Church had been decorated, either wholly or partially, on approximately nineteen occasions. Until the scheme of decoration believed to have been applied in 1973 variations on the theme of stone colour had been used on the majority of painted surfaces. The use of colour and gilding was a very recent phenomenon. The overall effect had been largely monochromatic, although for the first half of the nineteenth century it seems that a darker stone colour was employed on certain of the lower surfaces. Whilst soft distemper had been applied to the main ceiling until the early twentieth century, oil paint appears to have been used on the walls from the earliest times. The apse ceiling was generally painted with oil paint. It is unusual for the walls of a church of this period to have originally been painted with oil paint and suggests something about the wealth of the parish at that time. It was therefore a surprise that it was decided to employ a ‘so-called’ distemper of a type that was not available before the 1960s in the ‘restoration’. I have written about the problems of using such a paint in an earlier blog. Needless to say, problems have already occurred.